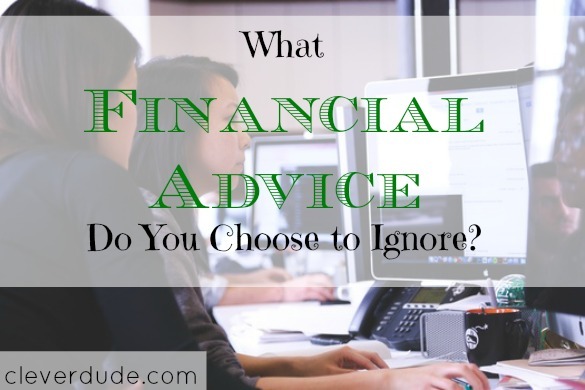 What Financial Advice Do You Choose to Ignore? Thereâ€™s no shortage of personal finance advice. If you browse the internet, you certainly know that. Every major news reporting or browser web page has a finance tab you can click to read about how you can save money, or manage your money more wisely. But just how much of the advice do you actually follow? I thought it would be a fun exercise to list some of the most common financial advice we read about over and over again (including here on Cleverdude) and I would talk about which ones I follow, and which ones I donâ€™t. Eliminate Credit Card Debt: This is a hard one to argue with. If you carry a balance on credit cards month to month you can almost hear the vacuum cleaner sound sucking money out of your pocket. Our major credit card debt is gone, all that remains is a few small store credit cards which weâ€™re working on next. Save For Retirement: Weâ€™re all going to get old, and hit that magical retirement age. My wife and I have dreams of traveling the world, so Iâ€™d better have money stashed away to do so once we reach those golden years. Which reminds me, Itâ€™s time to meet with our financial advisor again to make sure weâ€™re on track. Even if you don’t start saving for retirement until you’re in your 30’s, there’s still time to succeed! Emergency Fund: Having extra money stuffed away but easily accessible gives you peace of mind that you can handle those unplanned incidents that happen in life. Put a check mark next to this one for me, although Iâ€™d like to see our account a little bigger than it is right now. Those are the big three, that 99% of us would agree that we SHOULD follow (are you?). But what about some of those day to day items that maybe arenâ€™t so clear cut? Pay Cash For Your Vehicle: Again, itâ€™s a matter of paying interest. This is a little harder though, because it takes a lot of discipline to save up the kind of cash to purchase a vehicle. It IS possible to do so, and it would certainly save thousands of dollars in interest payments. This is a future goal of mine, but the reality for my family is, we arenâ€™t there yet. In fact, we just recently signed the paper work to replace our van. Cable Television: It seems a day doesnâ€™t go by without reading an article about how someone cut the cord, and is now living without cable. They replace standard cable with a multiple faceted solution including catching free broadcast stations, Roku, Hulu, Netflix and a host of other things. Cable is actually something we splurge a little on. We have a fairly healthy package, including some of the premium movie channel tiers as well as a multi-room DVR. Iâ€™m not ashamed of it, I love my MTV. Gym Memberships: Yes, you CAN get in shape without a gym membership. You donâ€™t have to look hard to find creative ways to exercise without paying for monthly gym membership. That being said, I have a gym membership and use it every single day. We got hit with a blizzard in the Midwest last week, and many of the sidewalks where I run either havenâ€™t been cleared yet, or theyâ€™re packed with ice and snow. Iâ€™m thankful for the indoor track at my gym to run on. I enjoy the variety of expensive machines and facilities that would not be available to me without my gym membership. Eating Out: Eating at a restaurant is more expensive than eating at home. It burns me to look at a receipt and know that I could have cooked the same thing at home better and cheaper. But sometimes you just donâ€™t feel like expending the effort, or youâ€™re on the go and you need the convenience of someone cooking for you. Thereâ€™s also the â€œspecial occasionâ€ factor. The net is, we eat at home as often as we can, but we do have the occasional meal out. Thereâ€™s a reason itâ€™s called personal finance. Your choices are based upon your income, your lifestyle, and your goals for the future. The above gives you snapshot into my choices, now itâ€™s your turn. Which popular personal finance advice do you follow? Which do you choose not to follow? I actually ignore (well, interept differently) the credit card and emergency fund advice. Normally, we pay our credit cards each month so never pay interest. However, by using them we earn significant rewards. However, we have also started stoozing to further take advantage of credit cards. I have Dishnet and plan to keep it for TV. I don’t belong to a gym. I do pay my credit cards off each month. I have an emergency fund. We have an amount for eating out in our budget and we don’t exceed that. We paid cash for our last car but financed or leased all others prior to that. I don’t know if we’d pay cash again or not. Hopefully we would because I sure hated those car payments. I guess the advice I ignore is the 4% draw down rule on your retirement accounts. We plan the amount we would need and invest to achieve that yield. We plan to only spend the earnings and leave the principle intact. The 4% rule is pretty generic and we don’t subscribe to the one size fits all approach. 1) Eating Out – This was actually discussed on our way back from date night last Friday. I’m an advocate for keeping our date night, as I think it has been a good way for us to connect. I would opt for an every other week model than to cut it out altogether. I find we eat out less other times in the week when we know we have one time on the schedule as well. 2) Gym – In the long run the lesson is that you should be USING the gym. Agreed that having a membership and not using it is a waste, but staying in good fitness will pay itself back in dividends over time. I use the gym constantly, and thus average less that $4 per hour at the gym. I say that is a pretty good use of funds. 3) Cable – This is another one that I’ve wanted to cut recently. We’ve only had cable for less than three years, and I’m ready to pair back. My husband’s response was. HBO? Whaaaaa! 4) Car – I would agree in theory, but haven’t actually had to test this. I’ve never had a car payment thus far, but I haven’t had a car in the last ten years. In theory I like the idea of cash. My dad just called it a day with his ’87 Dogde Caravan with 432,000 miles. It was paid for in cash in ’92. He replaced it with a ’92 for $1800. Now that is dedication. All the rest we abide to, by maxing out retirement and making sure we’ve got a safety net. Though we do risk it on occasion, for instance we are using part of our emergency fund to do renovations while we put one of our rentals on the market. If we were in a bind we could manage though. For me it’s budgeting. I know I should do it. I’ve written about it repeatedly. I made 1 once… but I really don’t have a budget. Which I’m sure is a stupid decision, but there it is. Great minds and all that, right?? @Kathy – wow, sounds like you have it together – you must be an avid personal finance blog reader. 🙂 I respect your thoughts on your retirement fund usage, you’re absolutely right, it’s not a one solution fits all. The 4% rule is a general guideline, but everyone has to fit it to fit their goals and lifestyle. @Miel – Great point on the Gym, we agree. Gym memberships are a waste of money if you signup and don’t use it (which happens to a lot of people). If it’s something that you use (and do I ever use it! ), it’s worth it’s weight in gold! Thanks for stopping by! @Mel – We used to not budget either…..and I could feel our overall finances start to circle the drain. Our ability to save up for future adventures as well as handle those unexpected events has improved dramatically since we started tracking our expenses, and planning our spending. Hope we can get you on the budget train! Great to have you stop by! I ignore the advice to pay cash for a vehicle (if you can get a low loan rate, you can make MORE money than you’d spend on interest having your money in an investment) and the gym membership. Then again, I only spend $10/month on my membership! @MoneyAhoy, 529 money does not go to the government. Yes, the government may change the rules for tax-free withdrawals for approved college expenses, but your money is invested in various mutual funds, depending on the state, that you get to pick. The fact that the government may change the rules can also happen to any other retirement/savings vehicles, and will almost certainly happen to Social Security and Medecare. So what? We can only work under the current rules. Any changes to 529s would likely not be done retroactively, but likely for earnings on money added after the change. We eat out about once a month. We can easily afford it and it’s fun. @MoneyAhoy – Giving money to the government should frighten everybody, lol….but as Bryce mentions in the next comment I don’t think they actually get their hands on your 529 funds. Are you currently saving for your your son’s college education? if you’re not using a 529 plan, what method are you using? I’m just curious as I’m also saving up for my son’s college and it’s always cool to hear what other people are doing.